Akinyemi Adetunji is an art curator and administrator; an alumnus of the Pan-Atlantic University, the Obafemi Awolowo University, Ile-Ife and a graduate student of Managerial Psychology at the University of Lagos. 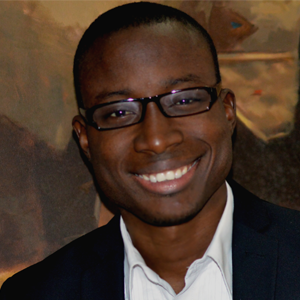 With an educational background in Management, Akinyemi specializes in art curation for New Media. He is a portfolio manager for a handful of artists, private art collectors and institutional organizations. He acted as the Assistant Director and Curator for the Pan-Atlantic University’s Virtual Museum of Modern Nigerian Art; one of the first institutional Virtual Museums in Nigeria. He is the present Curator and Manager at the FCMVA, where he has documented and curated approximately 12,000 contemporary Nigerian artworks since the Foundation’s inception in 2014 and he also doubles as the Art Director for Artyrama Online; the online gallery. Akinyemi Adetunji is a co-author of the book OSAGHAE -Visual Chronicles of a Society in Flux; a specialized monograph on Ben Osaghae, featuring scholarly research on the artist and his oeuvre. He contributed to the art book by Jess Castellote & Olayinka Fisher –KOLADE OSHINOWO and he is working on other titles. Akinyemi acts as Project Manager to many other art oriented projects including art exhibitions, documentary productions and book publishing projects, etc. © 2018 Foundation for Contemporary & Modern Visual Arts.